STORAGE - pockets to store your EpiPens or Insulin Pens, Auvi-Q, Asthma Inhaler, Benadryl, Eye Drops, Nasal Spray, small tube of Cream, Syringes, Vials, and Ice Packs safely. Sammie Medicine Case may not be able to store all of the listed medications at once. PREMIUM QUALITY & DURABLE - made with Love. External fabric is Top of the Range Polyester 1680D fabric + Reinforced YKK Zipper for added durability. Take it with you to the school, field trips, camps, travel, or simply put it to great use everyday! 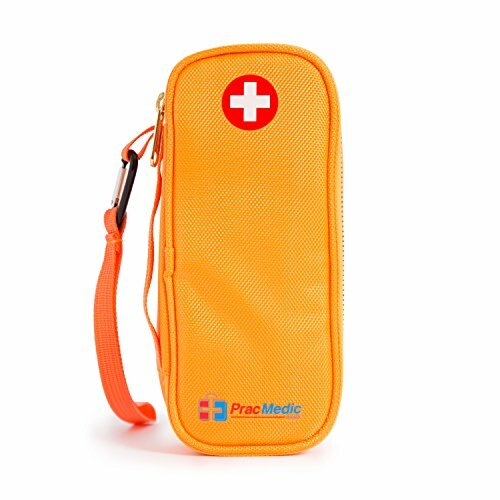 PROTECTION - the Medicine Case is insulated and padded with 5mm PE Foam & lining is made with quality Polyester 210T fabric which helps moderate its internal temperature. It is also Water Resistant to protect your medicine from unexpected wetness. VARIOUS CARRYING SOLUTIONS - you can hand carry it with the Hand Strap or Wristlet. Otherwise, use the durable Velcro Straps to attach the Medicine Case to your bag/backpack. Another option is to make use of the Carabiner to hook the Medicine Case to your bag, handbag, backpack. Or simply put it in your school bag or backpack. PREMIUM QUALITY - you deserve a Durable & Reliable Epi Pen Carry Case. Rest assured, it is made with high quality materials to ensure you get the best value for your purchase. PROTECTION - you have a peace of mind knowing your medicine is protected. Sammie Medcine is insulated to help moderate the internal temperature of its contents. However, it is not a cold storage pack unless it is used with Ice Pack(s). Any Ice Packs within the dimension of 7 in (L) x 3.15 in (W) should fit in the case. PRAGMATIC - designed with Functionality in mind, so you can store your essential medication in one case and access them easily when you need them most. Suitable for Adults, Men, Women, Teens, Kids, Boys, or Girls. If you have any questions about this product by PracMedic Bags, contact us by completing and submitting the form below. If you are looking for a specif part number, please include it with your message.